You deserve to feel as physically well as you can, given your strengths, limits, and season of life. Life is difficult, needing every physical advantage one can muster. When our body is unwell, it will get our attention eventually. Hitting rock bottom via physical, emotional, or relationship collapse is one way to get our attention. None of us want this yet many of us are the proverbial frog swimming in a pot of warm water, lulled into not noticing that the temperature is rising slowly sinister. A year ago, I was a boiling frog. I wasn’t hopping around, I was definitely green, and sick as a dog which is an awful blurring of animal metaphors. My weight has fluctuated under the radar for years. For example, at my highest weight during pregnancies, I was more than 60 pounds heavier than my ideal. And while the college freshman 10 is a myth, I actually did gain it. Twice. Whatever. The number on the scale never bothered me as long as I felt energetic, strong, and happy. After Christmas 2014, my 20 extra pounds that wouldn’t budge coincided with feeling lethargic, weak, and blue. Blue and green are pretty on a hydrangea, but not on me. After medical testing, receiving a vague “possible” diagnosis of “pre-pre-diabetic” from my soon-to-be-dropped primary care provider, I was told to “eat more fiber”. Fiber is going to fix all of this?! Fine, but how much is too much? What kind? How often? I didn’t want to randomly “eat more fiber” so I researched the best calorie counter app and chose MyFitnessPal to help me keep track. I logged everything I ate for a week. It consumed an inordinate amount of time but as the weeks rolled by, I learned that I had been eating plenty of fiber all along but that lactose was a problem, among other things. I became more aware of calories and slowly dropped weight right down to my ideal weight, which I had assumed I would never see again. I started feeling better and realized that there was a realistic hope that I could continue to feel better with the right help and tools. Once I was in the habit of logging and had reached more of my health goals, I decided to tap into the social part of MyFitnessPal. I’m so glad I did! There I found some of the most generous people on the planet. They are working hard to feel well, dropping or gaining weight (as needed), eating healthier foods, exercising like warriors, admitting to fears, and cheering each other onto health victory. Social Sharing Makes Losing Weight Contagious, Finds MyFitnessPal, shows again that finding a group of people who will inspire, encourage, and learn together works wonders. How do you stay healthy? What are your favorite fitness tips? What gets in your way? 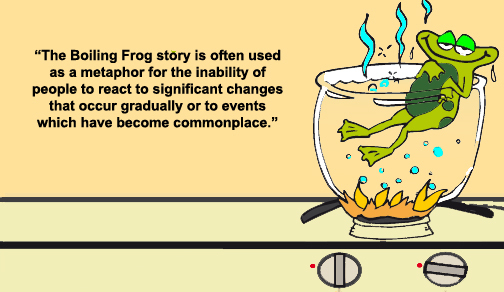 Are you a boiling frog? Are you ready to leap out of the pot and claim your wellness? Consider joining me at MyFitnessPal. I’m AngieMc6. If you are one of MyFitnessPals, thank you for visiting and I hope you will feel at home here. Thank you for all you do to help yourself and others! This entry was posted in Challenges, Community, Fitness, Health, Lifestyle, Performance, Relationships, Social Media, Solo and tagged Apps and Downloads, Family, How-to, MyFitnessPal. Bookmark the permalink. Glad to hear (er…read) you’re feeling better, and congrats on the weight loss. Such a hard thing for my wife and I to figure out. Glad it worked for you! Thank you, Dane. It really is a rather rough thing to figure out. Variables keep changing! I’ll write more about how my puzzle came together after years of confusion. As for the food piece of the puzzle, logging really helped and got me very close to my body’s particular needs. But it took me working with a naturopath who specializes in nutrition to really narrow it down. More on that in another post. My best fitness habit was the year we got a WiiFit and I thought I’d try exercising to see just what I could do. Somehow, between that, and deciding to eat considerably less, and whatever else was going on with me then it was just the right convergence of things to let me slim down from obese to being possibly underweight for my build. I used FatSecret for a while – same principle as MyFitnessPal, I’m pretty sure. It does! As does “Lose It” which was also recommended to me at some point. Ness, do you think some of the success of these places is going to come down to how well their apps run? I do, which makes me wonder if at some point I’ll need to look at another…but in the mean time I’m pretty invested in MFP if only for the ease of logging “my” foods quickly, to include recipes. I was off my eating a bit this last week because Devin and Henry visited and Ian was confirmed so lots of feasting. My system paid for it a bit so I’m eager to get back to my routine. Just not raw kale, which I tried to slip into my morning smoothie…yuck! Congratulations to your son Ian! Thank you and I’ll give Ian your well wishes!